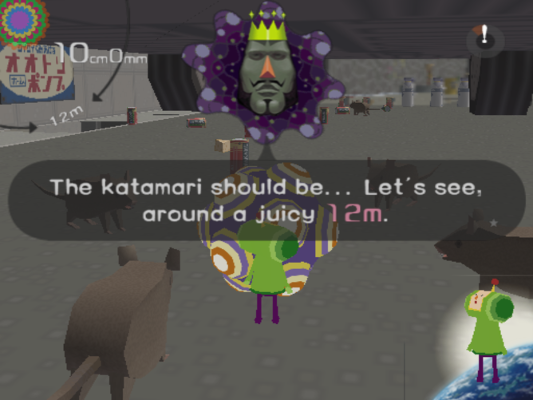 Katamari Damacy is a game that had always fascinated me with its concept. I was aware of it pretty much since the moment it came out back in 2004, but only recently did I get the chance to actually play through it. And I can happily say that it lived up to my expectations, and then some! 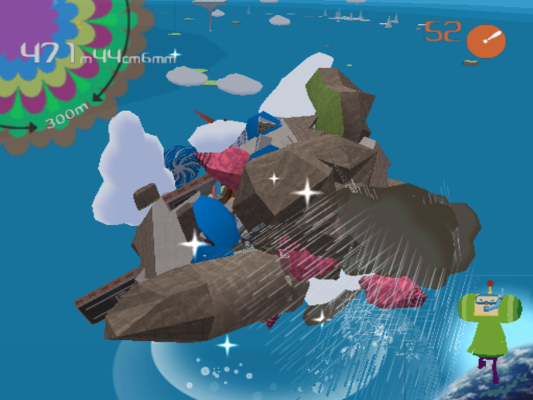 Katamari Damacy’s gameplay is sheer joy in its simplicity. It’s the kind of quirky creativity you’re only ever likely to find in Japanese games. 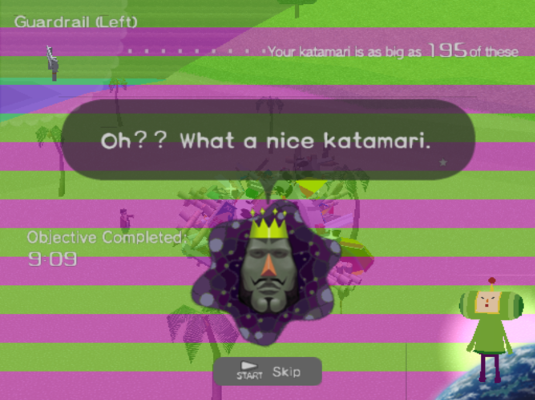 In fact, it would not be an exaggeration to say that, as far as strictly gameplay is concerned, Katamari Damacy is gaming’s best new idea in the last 15 years or so. Katamari Damacy is an action/puzzle game where the goal is simply to make your katamari big enough by rolling over other objects and absorbing them, making the katamari bigger. And then, when it’s bigger, you have sufficient size to roll up other, bigger objects, and so on. In my opinion, it’s fair to compare a design that is so simplistic, and yet never gets old, even to the likes of Tetris. Add to that a humourous and charming plot and characters, and a beautiful stylistic design, and you know this game is a rare achievement. From a purely technical viewpoint, the game is also impressive, managing to have hundreds of interactable objects on-screen at the same time – a feat considering the relatively weak PS2 hardware. 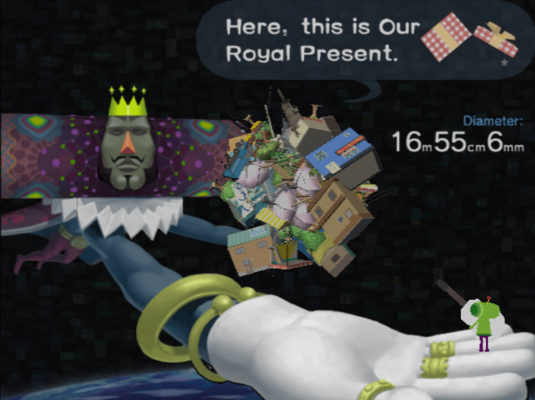 The protagonist you control in Katamari Damacy is The Prince, the tiny son of the mighty (in every sense of the word) King of All Cosmos. Already from the character design of these two, the game shows its incredible charm. The Prince is just a few centimeters tall, while the King is enormous, not to mention enormously badass. The King’s design is somehow incredibly fitting of his title. 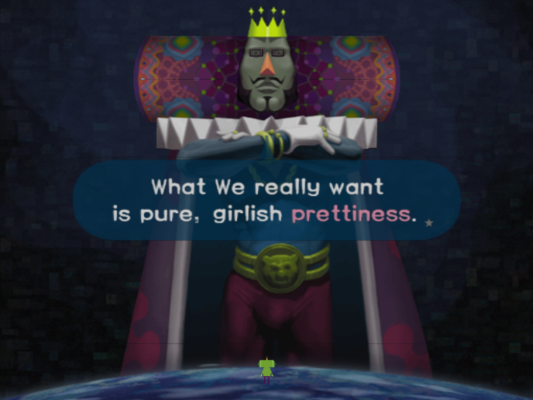 He is majestic, and capable of showing celestial kindness, as well as cosmic ire at The Prince, depending on whether he manages to make his katamari big enough at the end of the level or not. The Prince is tasked with effectively fixing a mess The King himself made – after a night of heavy drinking, The King managed to destroy all the stars in the sky! Having realised the scale of his carelessness, The King takes action to right this wrong and summons The Prince, explaining the situation. Like a good son, the tiny hero goes down to various locations on Earth to roll up some katamaris, which the mighty King then turns into stars to replace the ones he destroyed. 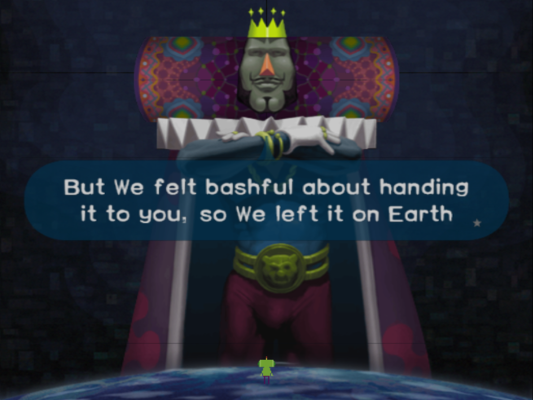 And since Earth is really full of stuff, it’s not hard for The Prince to find things to roll up and grow a bigger katamari. The only real obstacle in his way is The King’s relatively little patience. As the game progresses, we are kindly also offered the perspective of a family of citizens of Earth, consisting of a young girl and boy, and their parents. After every stage cleared, a cutscene continuing their story is shown, and we see how The King and The Prince’s work affects the ordinary people on the planet. The little girl is also gifted with special spirituality, allowing her soul to sense when a constellation has returned to the sky. While the story is simple and rather ridiculous, it is quite humourous and draws you in easily. 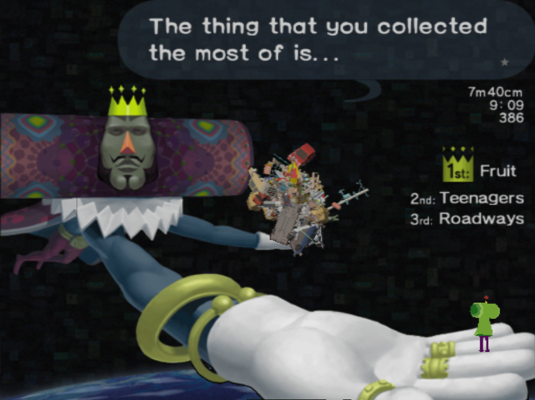 I could hardly resist the magnificence of The King, and every word of praise he uttered for The Prince (and those do not come easily) after a successful katamari rolling made me feel proud. The light-heartedness of the game is a key part of its charm. It’s quite remarkable how simple to play Katamari Damacy is. All you have to do is roll your katamari around in the 3D environment provided – with both hands, of course, because it requires an effort. You hold both analog sticks in the direction in which you want to roll. There are also several other moves you will learn, such as moving around the katamari, or jumping to the other side of it (effectively, a 180 turn). You can also dash forward along with the katamari, and you can have The Prince jump over the katamari to take a look around. You can climb heights about as big as your katamari if you push on forward facing them. And that pretty much wraps up the controls. Then, about rolling things up. For every single object you encounter on Earth, there is a necessary size to roll it up. If an object is considerably bigger than your katamari, you’ll bump into it and may even lose some objects attached to your katamari! As you start to approach an object’s “rolling up” size, you’ll notice you don’t crash into it like that. Soon enough, it will be part of your mighty ball! 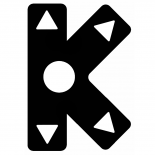 But, aside from stationary objects, there are also the moving bugs, animals, and even people, that you can also roll up, should you grow your katamari to the size that allows you to. As you can imagine, the bigger the katamari, the bigger things you can roll up, assuring that you grow faster and faster! Also, don’t forget to pay attention to the bottom left of your screen – you’ll see the object you most recently rolled up. This is another little bit containing much of the game’s charm – lots of the objects are typically Japanese things like playing cards for mahjong and other games I’m not even aware of, various kinds of food like sushi, rice balls and ramen, Japanese dolls like daruma and kokeshi, etc. Between stages, you can look at the collection of things you have rolled up, and read the fascinating object descriptions. Oh, occasionally, you can also roll up presents The King has left for you on Earth – these can be used as accessories for The Prince to wear. Through the game, we have the main “Make a Star” stages, where you roll your katamari around the house, the town, or the world. There are also special stages for making (usually Zodiac) constellations. The main stages always give you the goal of making the katamari a certain size or bigger within the time limit representing The King’s patience. Usually, the time is just barely enough to reach the goal if you do well, and there are some stages that will have you retry a few times until you make it… I know I did. But the challenge is fair – you simply have to make a good enough use of the objects surrounding you. The King also helps occasionally, pointing out areas that can only be accessed if your katamari is big enough – and you’ll definitely need to get there to reach the required size. “Constellation” stages have different objectives, usually to collect a number of specific types of object (for example, fish to recreate Pisces, or girls to recreate Virgo ). Katamari Damacy’s main strength may be the simplistic, yet brilliant gameplay, but the game’s overall charm follows closely behind. I already mentioned how interesting The Prince and especially The King’s designs are. But it is quite remarkable how the game kills two birds with one stone featuring low-polygon objects and people. Due to the limitations of the PS2 hardware, in order to have so many interactable objects on-screen, you’re pretty much forced to not use particularly detailed models. 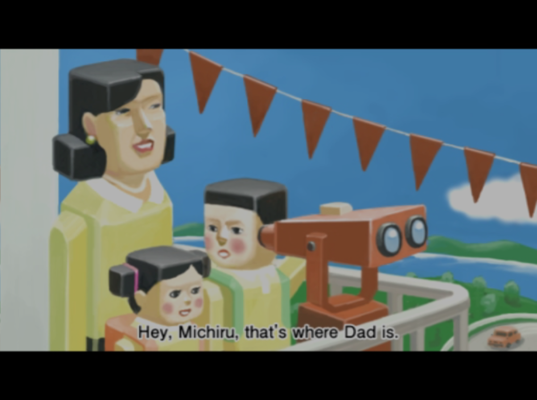 But Katamari’s creators turned this shortcoming into a strength, as the stylised models of everything featured in the game add immensely to its charm. It is beautiful in an “alternative art” way, never needing impressive graphical feats or breathtaking FMVs to achieve it. 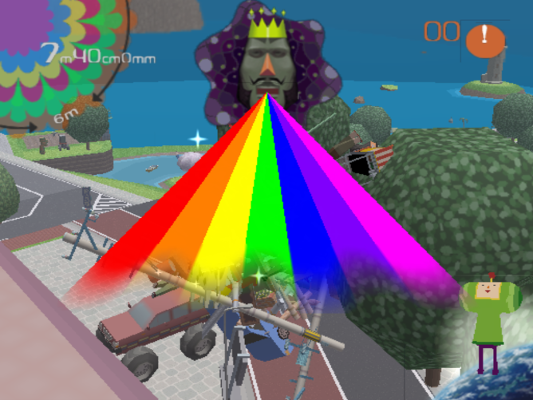 And then we get to yet another aspect the game is amazingly powerful in – the soundtrack… The Katamari Damacy soundtrack is completely in line with the game’s overall design philosophy – it is quirky, multi-faceted, and ultimately, very entertaining. There are songs from all kinds of genres – funk, classical, mambo, pop, there’s even a schoolchildren song… Most of the songs are vocal, and while there are maybe 6-7 that stand above the rest in terms of quality, each and every song is pleasant to listen to – something almost no game soundtracks have ever achieved. The one I picked here plays very early in the game, and is the funky “The Moon & The Prince”. But do listen to the whole soundtrack… You can really not go wrong. I love Katamari Damacy! I hadn’t had so much fun with a game in a long time… And I have to say, the size of the pleasure is directly proportional to the size of your katamari. When you reach a height allowing you to look at the world from the sky above… That is when the pleasure reaches its ultimate point, perhaps. 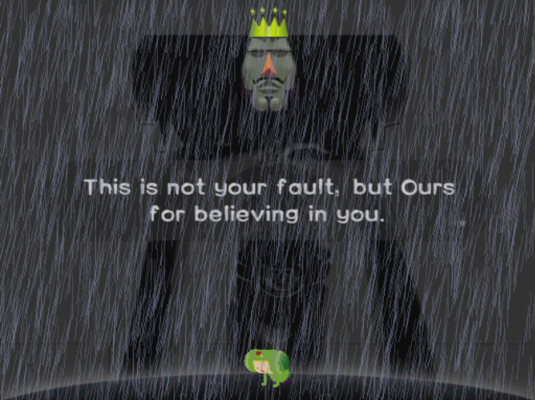 Katamari Damacy offers you that chance. 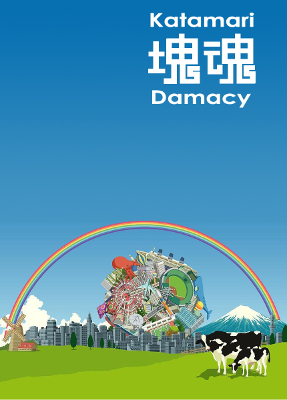 A very Japanese game that countless people around the world loved, Katamary Damacy is an achievement in gaming matched by very few others. It may not have reached amazing sales numbers, but there was hardly a person who played it and did not enjoy the time spent with it. Is there anything that matters more?